The news all Mustang lovers have been dreaming for so long is finally here. Ford Mustang GT, the iconic pony car from the American carmaker has been finally launched in India. Introduced at a starting price of INR 65 Lakh (ex-showroom, Delhi), Ford has brought us the sixth generation Mustang GT equipped with a 5.0-litre V8 under the hood. Ford India first unveiled the Mustang GT in the country right before the 2016 Auto Expo, promising a launch in the second half of 2016 and was Ford show-stopper at the expo. Staying true to its word the American carmaker has finally answered the prayers of us Indian enthusiasts who have been waiting for this iconic machine to come to your shores. But it surely comes with a heavy price tag owing to the fact that the car has taken the CBU route. It has been 52 years since Ford first launched the Mustang and it took the company that many years to finally bring it to India. Why you ask, well for the fact that before the sixth generation Mustang, Ford never had a right-hand-drive model. Although, over the years there have been many Indian enthusiasts who imported the car to India, during times when the road norms were more lenient. All that said we finally have the car in India it is the modern day pony car that has reached our shores. The India-spec version of the car will come with only the aforementioned range-topping 5.0-litre V8 petrol engine. The motor has been detuned from the Indian market, which now churns out 395.5bhp, a good 40bhp less than what the American version produces, which we drove last month. Even the torque has been brought down by 9Nm as the engine now develops 515Nm of peak torque. Power is sent to the rear wheels by a six-speed SelectShift automatic gearbox with steering-mounted paddle shifters. Ford offers the new Mustang GT with four different driving modes – Norman, Sport+, Track, and Snow/Wet modes. Each mode delivering power output as per its requirement. Coming to how the car looks from outside, the new generation Ford Mustang GT retains its brawny looks along with the All-American Muscle styling. 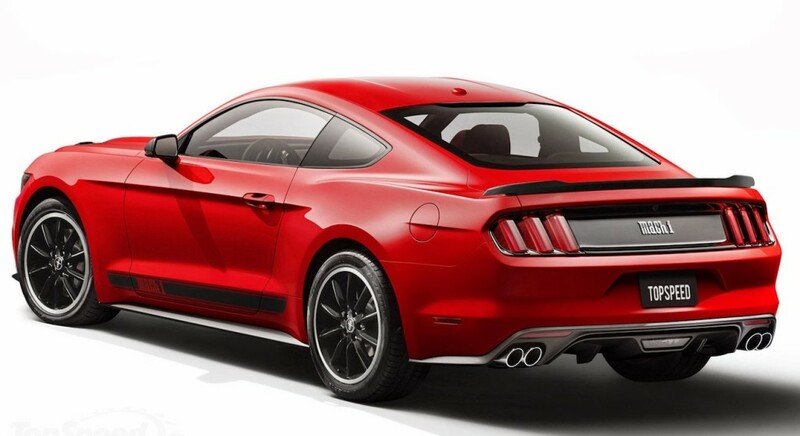 Right from the aggressive front section to its muscular character lines, the 2016 Mustang in no way disappoints us. The front end of the car features sharp projector headlamps with LED daytime running lights, while the wide trapezoidal grille and central air dam together create a hexagonal shape. On either side of the air dam the car gets round fog lamps and of course the symbol of the galloping horse at the centre of the grille. The car even comes with ‘Pony’ projection puddle lamps on the ORVMs. The sleeker profile of the car is further accentuated by the more steeply sloped windshield and rear glass. It is the side profile of the car that shows the imposing stance of the car with the long hood, slopping coupe-like roof line, 19-inch Magnetic Gloss paint machined aluminium wheels, and a protruding tail section. The rear end on the other hand comes with three dimensional tri-bar LED tail lamps and the GT badge at the centre all on a glossy black surface. Overall the new Mustang combines the classic styling of its predecessors and the modern features that make it worth of the price tag. The new Mustang GT comes with a cozy cabin draped in all-black interior with heated/cooled leather accented seats, suitable for four adults. This popular sports coupe offers features like – 8-inch touchscreen infotainment system with Ford SYNK2 with voice control, dual-zone HVAC system, adaptive cruise control, reversing camera, rear diffuser, rain-sensing wipers, and dual front airbags with additional curtain, side impact, and knee air bags among other features. Stay tuned for more updates! Do Share your Thoughts in the Comments section below and Do Not forget to Check Out our Trending Now section!